Whether you have a brand new air conditioner or one you have had for a decade, when it starts making unusual noises, you start panicking. Our Fort Collins air conditioning maintenance and service experts understand the different noises an AC unit can make, and will diagnose and treat the issue as soon as possible. 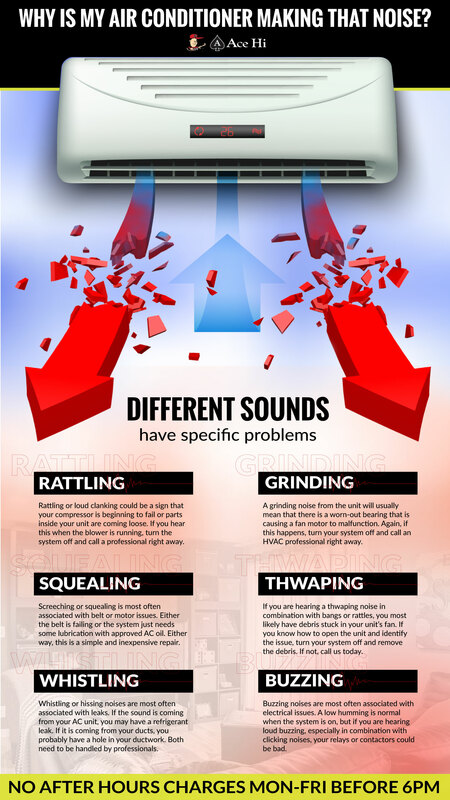 However, we understand that you want to know if the problem is serious enough to call the professionals, which is why we’ve complied a list of the top six air conditioning noises and what may be causing them. Many of these problems can be solved by our professionals, but they are also problems easily avoided with proper, annual air conditioning maintenance. Call now for immediate service, or contact us today to schedule your AC maintenance and service!